Dash camera video showed a Prince George's County police sergeant who delivered baby on the side of the road. News4's Barbara Harrison reports. 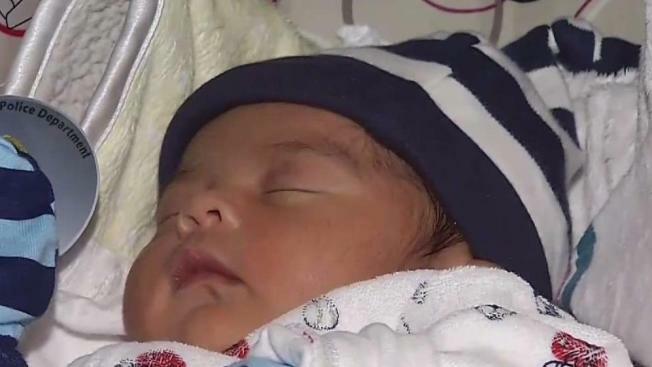 A Prince George’s County police sergeant helped deliver a baby boy on East West Highway in University Park, Maryland, Thursday night. According to the Prince George's County Police Department, a frantic expectant father flagged down Sgt. Nick Cicale while desperately trying to rush his pregnant wife to Providence Hospital. Although the father-to-be wanted his wife to deliver under medical supervision, baby Carlos had his own agenda. “Female is having a baby, like, right now,” Cicale radioed to dispatchers about 9:40 p.m. The cruiser’s dashcam captured Cicale immediately slipping on gloves and tending to the mother. In less than five minutes and with some last-minute contractions, out came Carlos alongside the busy highway. “Baby is out,” Cicale told dispatchers at 9:44 p.m. Earlier that day, the mother went to Providence Hospital with contractions but was sent home, saying she was not ready. Cicale, who works for the K-9 section, later visited and posed for photos with the family, a memento from his unforgettable night.